This is brilliant Connie, love the background paper and wonderful sentiment which sure made me chuckle! That little zombie is creepy looking scary - just like a zombie would look! Cute card with that background and side spidery ribbon. Fabulous Connie, love the background and ribbon. Such a fun card! Poor little zombie wasn't allowed to attend the ball though. Thanks for playing with us over at Cards in Envy! What a great Halloween card! 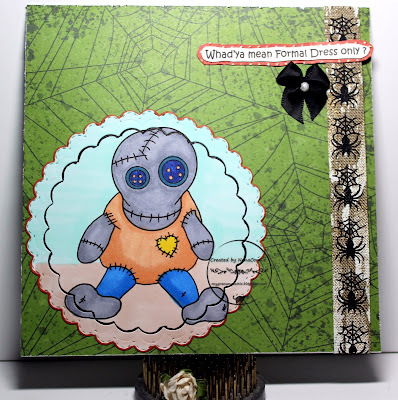 Love the spiders going down the side of your card and that zombie!! Oh my gosh that zombie is so fun and cute!! I just LOVE Halloween just like Tim Holtz and the creepier and spooky the better it is for me! :) Love your spider strip and those spiderweb papers too!! WOW! ahhh such a fun zombie card!!! thanks for playing with Cards In Envy!!! !